Releasing a 5 track project, produced by the likes of Filthy Gears, Doubtey and Defiant, Nesta has come with a ‘watch this space’ set of riddims, where we learn that he has a ‘won’t quit ‘till I win’ attitude, and intends to fully get the bag. With a variety of topics, wordplay, tight rhymes and vocal creativity, Nesta has come to stamp himself on the map, still. The first riddim ‘Trial & Error Intro’, Prod. Filthy Gears, kicks off with an off key piano melody which continues throughout most of the track, there’s a low low bassline, skippy rolling hihats, a heavy, but empty kick/snare pattern, and high bell-like synth accents floating over the top. Nesta lets us know he’s gonna just keep doing him, and he’s finding his sound, so we can watch him win. Wavey. ‘Unlikely’, Prod. Doubtey, comes dramatic, still, with a jarring stab-like melody, a hard kick/snare and busy hihats, the riddim has a relentless quality to it, and Nesta weaves his flows in all the spaces, coming like a man with a goal in sight ‘I don’t care if you don’t really like me/I ain’t here to please the whole Grime scene/I got bars while you got pipe dreams/You stop me in my tracks, unlikely’. This one’s a vibe. Track 3, ‘Setiquette’, Prod. Defiant, switches up to a busier pattern still, with a strong, skippy string synth melody, a bubbly low bassline, and fully patterned, kick/snare and hi hats. The vocals are doubled up in places and there are plenty of ad-libs. Nesta spends the riddim explaining the unwritten rules of shelling down a set, and laying out exactly how a man should roll, these times. The fourth riddim on the EP is a complete break in style of beat and bars, and is a little stroke of genius. Produced again by Doubtey, he comes with simple rousing bass stabs accompanied by only a kick, there is an occasional snare later, and the bassline is sparingly doubled up with a piano melody in the same pattern. Every now and then, some light rolling hi hats creep in, but the riddim as a whole is barely there. All the melody is taken on by Nesta, who spits entirely about shelling down sets, but using only football metaphors, throughout. Find yourself smiling every couple bars. This one’s a percy. The final track, ‘Looking To Earn’ is taken on by Doubtey again, this one starts with a muted horn synth bass and kick pattern, and as it gets louder the snare comes in, with symbol accents. There are vocal synths floating over the top, and some skippy kick/snare breaks, while Nesta spits about how he’s paid his dues these times, and it’s time he collects the coin from this ting, so he can keep doing it up, forever. 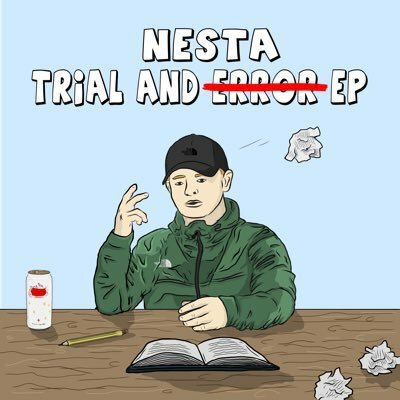 Showing a range of creative ability with his rhyming style, delivery, use of metaphor, and ability to shell on a variety of beats, Nesta is sure to get the attention of the scene with this one. Well worth the listen, fr.